TAVISTOCK Champion Sprinter in NZ on 2009-10. 6 wins-1 at 2-from 1100m to 1600m, NZ$333,025, A$286,375, Hawkes Bay Mudgway Partsworld S., Gr.1, Waikato Draught Sprint, Gr.1, VRC Blamey S., Gr.2, Henry Bucks Best Dressed P., Hawkes Bay Best Travel Sprint H., 2d WRC Thorndon Mile, Gr.1, MRC Vain S., L, WRC Dominion Post 2YO H., 4th MRC Caulfield Guineas Prelude, Gr.3. He entered stud in 2010. Champion Sire in Hong Kong in 2015-16. Third on NZ Sires List 2016-17. Sire of 300 progeny to race, 189 winners (63.0%), earnings of over $32 million, 17 stakes winners, 23 stakes placegetters, inc.
TAVAGO (12g, Stravinsky, Zabeel). 4 wins from 1600m to 2400m, NZ$70,775, A$1,582,625, ATC Australian Derby, Gr.1, Sky High S., Gr.3, Levin RC Wellington S., Gr.3, 3d ARC Karaka 3YO Mile, RL. TOMELILLA (12f, Dubai Destination, Dehere). 8 wins from 1200m to 1600m to 2018-19, NZ$208,485, Rotorua S., Gr.3, Counties RC Karaka Classic H., L, Wanganui JC Challenge S., L, Waikato RC Lodge City Rentals H., ARC Vertical Logistics H., Waikato RC NZI H., 2d Waikato RC Punters Challenge 5th May H., Hawkes Bay Trinity Hill H., 3d Taranaki RC Opunake Cup, L, BOP RC Tauranga Classic, L, Manawatu RC Humphries Construction H., Waikato RC New Zealand Bloodstock Insurance Pearl Series H., ARC Ellerslie Jewellers H., Bestaff H., Hawkes Bay Hawaiian Airlines H., WRC Douro Cup. HIFLYER (12g, Stravinsky, Mukaddamah). 9 wins from 1200m to 1600m to 2017-18, NZ$326,335, A$13,500, ARC Eagle Technology S., Gr.3, WRC Thompson H., Gr.3, Waikato RC New Zealand Red Cross H., WRC Thee Auld Floozie Cup, Whangarei RC Clansman Motel Bream Bay Bowl H., Waikato RC Foster Maintain H., BOP RC Phoenix on the Strand H., 2d Hawkes Bay Tarzino Trophy, Gr.1, ARC Easter S., Gr.2, WRC Metroclad H., Whangarei RC NZ Bloodstock Finance H., ARC Colgate Optic White H., New Zealand Herald H., Waikato RC Munns Winners Style H., 3d WRC Thorndon Mile, Gr.1, 4th ATC Winter S., L, Winter Challenge H., L.
GOBSTOPPER (12g, Zabeel, Ascot Knight). 6 wins from 2050m to 3200m to 2017-18, NZ$219,500, A$1,000, CJC New Zealand Cup, Gr.3, Waikato RC Skycity Waikato Cup 10th Dec H., Marton JC CR Grace H., Wairarapa RC Liquorland Masterton H., 2d Manawatu RC Pavemasters H., 3d Waikato RC BCD Group H.
Travimyfriend (12g, Carnegie, Tights). 4 wins at 1200m, 1400m to 2017-18, NZ$119,750, A$3,100, WRC Mitsubishi Electric S., 2d WRC Hiremaster H., Hanley Formula H., Marton JC H&T Agronomics H., 3d Otaki Maori RC WFA S., Gr.1, BOP RC Japan-New Zealand International Trophy, Gr.2, WRC Anniversary S., Gr.3, Taranaki Cup, Gr.3, Hawkes Bay Tarzino Mile H.
Milseain (14f, Zabeel, Ascot Knight). 3 wins from 1400m to 1800m to 2018-19, NZ$75,500, A$42,475, ATC Tab.com.au H., 2d Hawkes Bay Lowland S., Gr.3, 3d New Zealand Oaks, Gr.1, Waikato RC Sir Tristram Fillies Classic, Gr.2, WRC Desert Gold S., Gr.3. Spring Delight (15f, Zabeel, Hermes). 2 wins at 2100m in 2018-19, BOP RC Snow Williams Bayleys Real Estate H., 2d Manawatu Classic, Gr.3. Excalibur (13g, Stravinsky, Zabeel). 6 wins at 1600m, 2100m to 2017-18, NZ$137,262, ARC Auckland Eye H., Coca-Cola H., Waikato RC Red Cabs H., Counties RC Mount Shop H., Otaki Maori RC NZ St Leger Trial, 2d Counties RC Karaka Classic H., L, 3d Waikato RC Happy 60th for Barbara Hawes H., 4th Waikato Cup, Gr.3. His sire sons include Tarzino, etc. Champion Sire in Hong Kong in 2015-16. Third on NZ Sires List 2016-17. TAVISTOCK (c by Montjeu (Ire)) 6 wins. See below. Kabuki (f by Shinko King (Ire)) 2 wins at 1200m, 1400m, 3d Hawkes Bay Be Sunsmart Today H., 4th CJC Inglewood S., L.
Campinas (g by Captain Rio (GB)) Winner at 1300m, 2d STC Freeway Hot-Fridays P.
Champion Stage (f by Mastercraftsman (Ire)) 2 wins at 1600m, 1800m in Aust. Steal the Show (f by High Chaparral (Ire)) Winner at 1200m in Aust. Over Play (f by No Excuse Needed (GB)) Winner at 1600m in NZ. Bits and Pieces. 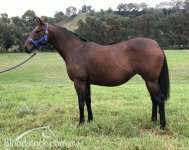 Winner at 1100m in 2018-19, 3d Avondale JC Avondale Sunday Markets 2YO Classic. Velocity Miss. Winner at 2, 2d ATC Sydney Markets Sprint 2YO S., 3d ATC Lidoran Group 2YO P.
Gee One Express. 3 wins from 1500m to 2400m to 2017-18 in Aust. Sonsee Array. Winner at 1200m in 2017-18 in Aust. Sarazen. Winner at 1200m in Aust. Gospel. 4 wins at 1200m, 1400m, Manawatu RC Ascend Sales H., Waikato RC NZTI H., Wanganui JC Dave Hoskin Carriers H., 2d Counties RC Lime Country Thoroughbreds H., 3d Taranaki RC Hirequip H., ARC Tupperware H., Waikato RC Classic Hits 98.6 H.
Fire Show (g Showcasing) Winner at 2 in 2017-18, 3d Ashburton RC John Grigg S., Gr.3, Hororata RC Selwyn Rakaia Vet Services S., 4th CJC Zacinto S., L, Gore Guineas, L.
SLICE OF CLASS (f Guillotine) 4 wins at 1200m, 1400m, NZ$141,236, CJC Canterbury Breeders S., Gr.3, Otaki Maori RC Hunting & Fishing H., 2d Egmont RC Taranaki Breeders S., Gr.3, Marton JC Pioneer Seeds H., 3d Counties RC Auckland Thoroughbred Breeders, Gr.2, Wanganui JC Coro Angel Syndicate H., 4th WRC Thorndon Mile, Gr.1, Desert Gold S., Gr.3, CJC Warstep S., L.
PRECEDENCE (g Zabeel) 10 wins from 1600m to 2600m, A$1,952,280, Moonee Valley Gold Cup, Gr.2-twice, VRC Queen Elizabeth S., Gr.3, MVRC JRA Cup, Gr.3, BRC Premier's Cup, Gr.3, STC NE Manion Cup, L, VRC PFD Food Services H., MRC Galilee Series Final H., MVRC Adapt Australia H., Tatts Group H., 2d MRC St George S., Gr.2, BRC Premier's Cup, Gr.3, VRC St Leger, L, ATC NE Manion Cup, L, MRC Fox FM Boulevard H., Benalla Toyota Gold Cup, MRC Malua H., 3d MRC Zipping Classic, Gr.2, Herbert Power S., Gr.2, GCTC AD Hollindale S., Gr.2, 4th VRC Australian Cup, Gr.1, MVRC Dato' Tan Chin Nam S., Gr.2, Drake International Cup, Gr.2. The Raj (g Grosvenor) 4 wins from 1200m to 1600m, NZ$93,175, CJC New Zealand Horse Shoe Company H., Robbie's Bar & Bistro H., Ainger Tomlin Chartered Accountants H., 2d Canterbury Gold Cup, Gr.3, Manawatu Classic, Gr.3, North Canterbury RC Canterbury S., L, CJC New Zealand Horse Shoe Company H., 3d New Zealand Two Thousand Guineas, Gr.1, Amberley Cup. Dancing Attendance (f Danehill Dancer) 4 wins at 1600m, 1900m, NZ$36,350, A$80,030, ATC Ascot Club H., Chargrill Charlie's H., Georges River H., Matamata RC New World H., 2d WRC Trentham S., Gr.3, ATC Tabsportsbet H., 3d ATC Rydges Campbelltown H., AJC Cranebrook P., 4th Matamata RC Kaimai S., L. Producer. Temoin. 8 wins from 2300m to 4900m, Maisons-Laffitte Prix de Saint-Hubert, Deauville Prix du Pays d'Ouche, Saint-Cloud Prix Poetess, 2d Longchamp Prix de Villeron, 3d Ascot Long Walk Hurdle. JUPITER ISLAND (c St Paddy) 14 wins from 2300m to 2800m, £182,756, 435,900fr., US$100,000, 80,140,000¥, Royal Ascot Hardwicke S., Gr.2, Longchamp Prix du Conseil de Paris, Gr.2, Newbury John Porter S., Gr.3, St Simon S., Gr.3-twice, York Ebor H., L, Japan Cup, L, Ascot Red Deer H., Newbury Coral Autumn Cup H., 2d Newmarket Jockey Club S., Gr.2-twice, Royal Ascot Hardwicke S., Gr.2, 3d Santa Anita San Juan Capistrano H., Gr.1, Laurel Washington DC International S., Gr.1, Grand Prix de Deauville, Gr.2. Sire. PRECOCIOUS (c Mummy's Pet) 5 wins at 2, York Gimcrack S., Gr.2, Goodwood Molecomb S., Gr.3, Royal Ascot Norfolk S., Gr.3, Sandown National S., L. Sire. NAKAYAMA EXPRESS (g Warning) 2 wins at 5f, Curragh Rockingham H., L, 2d Curragh John Roarty Memorial Scurry H., 3d Curragh Guardian Insurance 3YO H.
SINGLE (g High Chaparral) 6 wins from 1400m to 1900m, A$363,950, ATC Sky High S., L, Bridgeview H., Blackwoods MacNaught H., Vinery Stud H.
AU REVOIR (c Singspiel) 5 wins from 2400m to 2500m, €135,210, A$419,000, MRC Zipping Classic, Gr.2, Toulouse Derby du Languedoc, L, Grand Prix de Clairefontaine, L, VRC Bitalli H., 2d Longchamp Prix Lord Seymour, L, 3d Moonee Valley Cup, Gr.2, Saint-Cloud Prix Caius, 4th Longchamp Prix Foy, Gr.2, Prix de Lutece, Gr.3, Saint-Cloud Prix Exbury, Gr.3. PERFECT STRIDE (c Oasis Dream) 4 wins-1 at 2-from 7f to 1¼m, £113,843, Ascot Paradise S., L, Royal Ascot Wolferton H., L, 3d York Strensall S., Gr.3, Goodwood Select S., Gr.3. LAW LORD (g Diktat) 3 wins-2 at 2-at 1200m, 1800m in France and Saudi Arabia, Saint-Cloud Prix Saraca, L, Chantilly Prix d'Ommeel, 2d Chantilly Prix Sigy, L, Nad al Sheba Invasor H.
QAZYNA (f Frankel) 2 wins at 1600m, 1800m in 2018, Chantilly Prix Casimir Delamarr, L, Newmarket Bet365 Fillies' S., 3d Newmarket Pretty Polly S., L, Fillies' Series Mile H.
GLASS OFFICE (c Verglas) 4 wins-3 at 2-at 6f, £112,266, 18,350Dhs, York Duke of York S., Gr.2, Kempton Sirenia S., Gr.3, 2d Haydock Sandy Lane S., L, 3d Ascot Foundation Developments 2YO S., 4th Goodwood King George S., Gr.2, Salisbury Cathedral S., L.
VOLKS LIGHTNING (f Volksraad) 6 wins to 1250m, NZ$228,927, to 2018-19, Rotorua RC Arawa S., Gr.3, 2d ARC Darley P., Gr.3, Mr Tiz Trophy, Gr.3, 3d ARC Railway S., Gr.1, Concorde H., Gr.3, Cambridge Breeders S., Gr.3. THRILLING DAY (f Groom Dancer) 6 wins-3 at 2-from 6f to 8½f, Newmarket Nell Gwyn S., Gr.3, Keeneland Jenny Wiley S., Gr.3, Curragh Round Tower S., L, Goodwood Oak Tree S., L, Doncaster S., L, 3d Goodwood Supreme S., Gr.3. Producer. THORN TREE (g Thorn Dance) 6 wins-1 at 2-to 7f, Ellis Park Kentucky Colonel S., L.
ADORNMENT (f Medaglia d'Oro) 2 wins at 1600m, 1800m, A$111,905, in 2018-19, Perth Racing Ascot One Thousand Guineas, L, Western Racepix H., 2d Perth Racing Lavazza P.
HAUSSMANN - FORTUNE GENERATION (Mac.) (g Pour Moi) 2 wins-1 at 2-at 1100m, 1400m to 2017-18, ARC Great Northern Foal S., L, Hawkes Bay Windsor Park Stud H., 2d Waikato RC Waikato Equine Veterinary Centre S., L, ARC Auckland Co-Op Taxis 2YO H.
KRAYYAN (c Tower Walk) 2 wins at 2, Sandown National S., L, 2d Royal Ascot Norfolk S., Gr.3, 3d Newmarket Middle Park S., Gr.1, Newbury Mill Reef S., Gr.2, Newmarket Palace House S., Gr.3. Sire. Picnicing (f Good Times) 3 wins at 6f, 3d Newmarket Hopeful S., L. Producer. RAINBOW DANCING (f Rainbow Quest) 2 wins at 1800m, 1950m, €96,250, Longchamp Prix Casimir Delamarre, L, 2d Toulouse Prix Fille de l'Air, Gr.3, 3d Saint-Cloud Prix de Flore, Gr.3, Maisons-Laffitte Prix Jacques Laffitte, L. Producer. POLE POSITION (c Sharpo) 3 wins-2 at 2-to 1300m, Deauville Prix de Meautry, Gr.3, Saint-Cloud Prix Eclipse, Gr.3, 3d Deauville Prix Maurice de Gheest, Gr.2, Saint-Cloud Prix Thomas Bryon, Gr.3. Sire. PAMONA (f Duke of Marmalade) 2 wins-1 at 2-at 7f, 1¾m, York Silver Cup, L, 2d Saint-Cloud Prix Solitude, L, 3d Royal Ascot Ribblesdale S., Gr.2, Newbury Fillies' Trial S., L.
PRIANCA (f Diktat) 2 wins-1 at 2-at 1400m, 1600m in Italy and Germany, Milan Premio FIA European Breeder Fund, L, 2d Cologne Preis des Union Gestuts, L, 4th Milan Premio Sergio Cumani, Gr.3. Producer. PRESTO VENTO (f Air Express) 5 wins-4 at 2-to 7f, £151,262, Sandown National S., L, Lingfield Chartwell S., L, Newbury Weatherbys Super Sprint 2YO S., 3d Lingfield Fleur de Lys S., L. Producer. SOVIET FLASH (c Warning) 2 wins-1 at 2-at 7f, 1m, York Hambleton S., L, 2d Doncaster Fenner Conveyor Belting Challenge Trophy, 3d Epsom Diomed S., Gr.3, Kempton Magnolia S., L, 4th Newmarket Joel S., L. Sire. Play Me (f Nashwan) Winner at 1¼m, 3d York Musidora S., Gr.3, Goodwood Alice Keppel H., L, Warwickshire Oaks, L, 4th Haydock Lancashire Oaks, Gr.2. Producer. Champion Sprinter in NZ on 2009-10. MONTJEU Champion 3YO colt in Europe in 1999. Head of The 1999 International 3YO Classification. Top of The 2000 International 4YO+ Classification (long). Champion 3YO in France & Ireland in 1999 (Long). Champion Older Male in Ireland in 2000 (Intermediate). Champion Older Male in France & GB in 2000 (Long). 11 wins-2 at 2-from 1600m to 2400m, £1,013,955, 10,820,000fr., 20,000,000¥, Chantilly Prix du Jockey Club, Gr.1, Ascot King George VI & Queen Elizabeth Diamond S., Gr.1, Prix de l'Arc de Triomphe, Gr.1, Irish Derby, Gr.1, Curragh Tattersalls Gold Cup, Gr.1, Grand Prix de Saint-Cloud, Gr.1, Longchamp Prix Foy, Gr.2, Prix Niel, Gr.2, Prix Greffulhe, Gr.2, Prix Isonomy, L, Chantilly Prix de la Maniguette, 2d Longchamp Prix Lupin, Gr.1, Newmarket Champion S., Gr.1, 4th Longchamp Prix de l'Arc de Triomphe, Gr.1, Japan Cup, Gr.1. He entered stud in Ireland in 2001. He entered stud in NZ in 2001. Champion French Sire (& by AEI) in 2005. Second on GB/Ire. Sire List in 2005, 2011, 2012, third in 2007, 2008, 2009. Second on NZ Sire List (Aust. & NZ figures combined) in 2008-09. Third on Aust. Sire List (AEI) in 2008-09, 2010-11. Second on GB/Ire. Sire List (AEI) in 2005, third in 2011. Champion Broodmare Sire in Hungary in 2013. Sire of 1234 progeny to race, 822 winners (66.0%), earnings of over $151 million, 126 stakes winners, 77 stakes placegetters, inc.
CHICQUITA (10f, Dansili, Zafonic). Champion 3YO Filly in Ireland in 2013. Champion Older Female in Ireland in 2014 (Long).Winner at 1½m, £65,367, €502,200, US$90,000, Irish Oaks, Gr.1, 2d Chantilly Prix de Diane, Gr.1, Curragh Blandford S., Gr.2, 3d Ascot British Champions Fillies & Mares S., Gr.1, Longchamp Prix de la Chapelle. RED CARDINAL (12g, Zafonic, Topsider). Champion Older Male Stayer in Germany in 2017.7 wins from 1900m to 3200m to 2018-19, £22,255, €74,550, US$220,000, A$340,150, Hoppegarten Oleander Rennen, Gr.2, ATC Sky High S., Gr.3, Belmont Gold Cup Invitational S., Gr.3, ATC Parramatta Cup, L, 2d Cologne Preis von Europa, Gr.1, 3d Newbury Geoffrey Freer S., Gr.3, ATC St Leger S.
His sire sons include Authorized (31), Hurricane Run (29), Motivator (27), Tavistock (17), Camelot (14), Pour Moi (6), Gallant Guru (6), Guillotine (5), Jukebox Jury, Nom du Jeu, Scarface, Montmartre, Mettre en Jeu, Gorky Park, Walk in the Park, Chinese Whisper, Roman Emperor, Mr Vegas, Stagelight, etc.